It’s kind of ironic that I have come to Hanoi to write, and yet struggle to find time to write a regular blog post. But rest assured, although I have been quiet here, words have been written, and ideas are percolating, and adventures which will, one way or another, make their way into my future writings, are being had. Many of those adventures seem to involve traffic, a topic which seems to keep coming up in my writing and in my conversations. Yesterday, talking with some lovely new friends about overcoming fears and taking risks, I found myself using an analogy, comparing the doubt we have about taking risks to the moments before crossing a busy Hanoi road. The moments when we wonder if the traffic will ever clear enough, and if we should risk it or just go back where we came from. And I talked about how, once you do take that first step, a pathway kind of appears – not a straight line but an awareness of the gaps. And how good it feels to get to the other side. As I said this, my friends nodded in agreement, and I knew I had to try to put all that into a poem. Before I show you what I came up with, here is a glimpse of the kind of road I mean. This footage was taken just after I had crossed both of the roads at a busy intersection (to end up diagonal from my starting point). It is actually an intersection with traffic lights and even walk signals but red lights and little green men do NOT mean the same thing here as they do elsewhere. And the most dangerous part is often on the pavement, because the motorbikes leave the road, cut the corner on the footpath, then duck back onto the road. You might get some sense of what I mean in the video. The best part is – this is not the busiest road I have crossed. Anyway, here’s my attempt to craft my analogy into a poem. is just a metaphor for life. to just stay where you are. by leaving your safe spot. 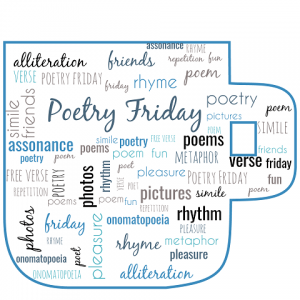 Today’s Poetry Friday Roundup is hosted by Brenda at Friendly Fairytales. Head over there to see links to loads of other poetry goodness. Have a good week – and watch out for motorbikes! PS. This post, and my visit to Hanoi, are made possible by the amazing Asialink Arts Program, and with the funding support of the the Western Australian Government through the Department of Local Gov ernment, Sport and Cultural Industries. Oh my, I take it that traffic laws are just the merest of suggestions. I love how your metaphor came together in your poem. So much of the “rules” of life are just suggestions, too, and we have to be brave enough to take the first steps and keep on going. Wow. Thanks for the video. I think no matter how you tried to describe that scene with words, it would have fallen short. That’s just…amazing! I can’t imagine that level of chaos being the norm! I guess you’d get used to it and adapt. Your poem contains big truths for life. Wow Sally, I like Irene’s comment above that it’s “more dangerous to stand still” just might be. Brava for mastering these streets and weaving the experience into poems that parallel life. I’m glad I don’t have to deal with such traffic in my life!! But happy that your traffic inspired a terrific poem. Thanks Buffy. I am glad that this traffic is a novelty to me and not my forever reality. That video is terrifying! I love what you made of it, especially “you wonder if it’s safer / to just stay where you are. / But then you remember your goal / and you know / you can only do it / by leaving your safe spot.” Yes, what a fitting metaphor for moving through life. I love the thought that a path appears when you need one. Thanks JoAnn. I have to cross one such road to get breakfast every day and there have been days when I’ve wondered how much I need breakfast! But yes, paths open every time. Sally, before seeing the video I lifted this line from your text: “once you do take that first step, a pathway kind of appears – not a straight line but an awareness of the gaps.” That rang true about life. Then, I saw your video and I thought, “I would not be able to handle driving in Hanoi.” On the other hand, How do we move forward if we are blocked by our fears? Thanks for the words to live by poem. Thanks Carol. I have to admit I don’t think I could drive here either. on foot I have some sense of being in control. But I guess if I lived here longer I would take that next step and drive, because it would open up places and options. Crossing that busy road is a great metaphor for life in general. Zig Zag indeed! Enjoying all your Hanoi adventures, Sally. Thanks Jama. I am so glad to be able to share my adventures this way. That’s not the busiest road you have crossed??!! I guess the thing about life’s road is that you may THINK you see what’s coming, but something new can pop up! Sp true Tabatha. And as I wrote this poem I crossed my fingers that my next post isn’t about the day I got hit by a bus, lol. Thanks Irene. It’s funny how many people have told me this past few months that I am brave. And I balked at that descriptor, because I know how I feel inside, and it isn’t always what I would call brave. But then I realise we are all brave just to take any steps at all! And courage is many different things. I am so glad you shared the video, and love your intro as well as that ‘zig-zag’ of the poem, “an awareness of the gaps” makes wonderful sense to me. My own mantra is to just take that first step, and it feels as if that’s what one must do, here, in that real traffic or life’s. This should turn into a picture book, Sally! High praise Linda. Thank you. The first step is always the hardest one, I find. My goodness, you are such an adventurer! Can I travel with you sometime? You seem to like the foods I like and the adventure I like AND writing poetry. LOL. Seriously, I’m so enjoying the joy that comes across in your travels. This poem is one that I think you will look over in a decade or so and the memories of sheer terror and adjusting course will just flood back. Oh Linda I would love to travel with you! This whole adventure is one I will look back on – almost every day I have asked myself ‘what am I doing here!’ but only in odd moments because the rest of the time I am going woooooow. I feel like I am in the middle of the street at the moment, with cars and motorbikes whizzing around me – I just have to keep my eye on the other side of the street, because I’ll get there in the end! You will Jane, you will!